We are a Star Wars collecting podcast and website that focuses on why we collect and how we collect. Rather than being a source for breaking Star Wars collecting news (there are many others better suited to that), we like to discuss what the news will mean to those of us who collect Star Wars. On The Sandcrawler, we like to discuss how collections are displayed and have a dedicated page on this website for fellow collectors to share photos of their own collections. It’s a great way to show off favourite collectibles and a great source of inspiration when you’re looking for a new way to display your collection. We are always looking for new collections to spotlight so be sure to email us photos of your collection! Above all, The Sandcrawler’s goal is to be a positive, family-friendly and fun to listen to. As we like to say, we are your home for ACTION FIGURE THERAPY! PROUD MEMBER OF THE Star Wars COMMONWEALTH PODCAST NETWORK! •We were invited by Funko to attend the Hollywood premiere of Making Fun: The Story of Funko and Mike was chosen to be one of four audience members to ask a question at the Q&A that followed the screening. •Dan was instrumental in having Star Wars bounty hunter, Dengar, become immortalized as a Funko POP and was invited by Funko to attend New York Comic Con to officially unveil the figure and was featured in a YouTube video along with Guardians of the Galaxy’s Michael Rooker and WWE Superstar, Zack Ryder. •Dan has had Star Wars voice actor, Stephen Stanton send pizza to him and his fellow Force Friday line-goers twice, an event that is always fun to follow on Twitter. •We attended Star Wars Celebration Orlando 2017 and our “Jawa socks” swag was a big hit. •Mike and his Star Wars room were featured in the first Fully Operational Fandom column on StarWars.com. •We have been fortunate to host Cory Churko, Brian Stillman, Jordan Maison, Yoko McCann, Adam Bray and Zack Ryder to talk about their collecting stories. Mac and Dan meet Luke Skywalker himself, Mark Hamill at Star Wars Celebration Orlando 2017. He is clearly impressed with our show t-shirts. 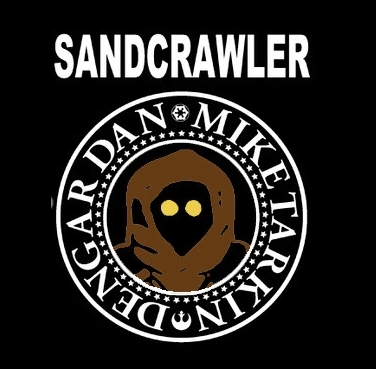 thank you for visiting The Sandcrawler! your hosts love Star Wars collecting, it's that simple. It is an obsession and some might say a disease. Your hosts on the red carpet in Hollywood. We aren't sure but they may be cosplaying as hockey announcers. Mike (Tarkin) MacDonald is an old Canadian, born during Canada's Centennial, 1967, who was there for the beginning of Star Wars in all of its glory way back in the 1970's. With his start in the original Kenner figures to his love for the first Marvel Star Wars comics, Mac has lived through it all (Seriously, how many nicknames can one guy have?). He rekindled his collecting frenzy in the 90's once he gave up his punk rock ways. Mac is a strict 3.75 inch figure collector. Or at least he tells himself that. When Mac is not changing or adding to his amazing Star Wars room, he is an autoworker, avid camper and Walt Disney World fanatic. You will find him being the ultimate family man. Mike is the brains, heart, and soul for this site and podcast, without him none of this would be possible. Mac is also a big softy. He has written for Coffee With Kenobi and From 4LOM to Zuckuss.com and has been a guest on TechnoRetro Dads, Galaxy of Toys, Starships Sabers & Scoundrels, Coffee With Kenobi, The Deucecast Movie Show and Brews & Blasters. (Dengar) Dan Lizotte is here for the ride. Born in the mid 80’s he discovered the Wars when he was 4 or 5. Dan is an eclectic collector, who never seems to be able to stick to one focus in collecting. Dan lost his childhood collection and for the last 3 years has been collecting at a ferocious pace, an almost unhealthy pace. A former Marine and current firefighter/paramedic, Dan brings a twisted sense of humour to his Star Wars fandom. No worries, you probably won’t see much of that side of him for legal reasons. While Mac does all the heavy lifting, Dan’s aim is all for the laughs. He very rarely is serious and his wife and son can vouch for that. Apart from co-hosting The Sandcrawler, Dan is one of the biggest Funko POP Star Wars collectors around.